Pad Thai quest for the perfect Thailand Pad Thai » russell freeman stock photography Russell Freeman on Google+! I have made this wonderful Thai creation many times for myself and guest. Anyone thinking of Thai Food, well this is the first thing that comes to mind, including mine too. While living in Thailand 2014-2015 I became a bit of a cooking creation “how to do that” person. 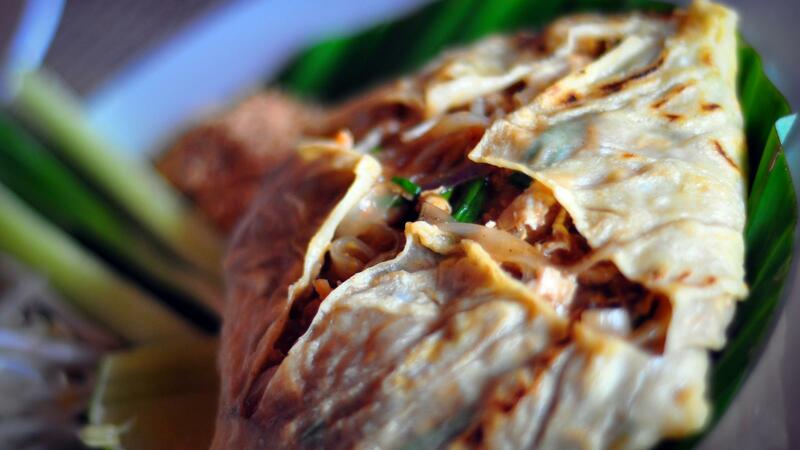 Part of this creation was always the question of what is really a Thailand National Dish. Everyone or anyone you talk with be it a Thai person or a tourist on the street, say Pad Thai. But really what is Pad Thai and more to the question where did it come from, who created this dish. To my surprise the dish is original style of Chinese cooking methods, adapted into the Thailand style. The Pad Thai along with many other Thai creations all come originally from China many many years ago, see BBC article for more details. Now to answer this and a few more questions, I shall re-print a news article from the BBC, who asked the exact same questions. What is PAD THAI ?? I wish to reach out to “M Me” and “Pim” for help many time at their restaurant in Bang Chang Thailand to help guide me in the process of Thai cooking, sharing the secrets from the family in traditional Thai cooking methods, to this I say thank you very much !! 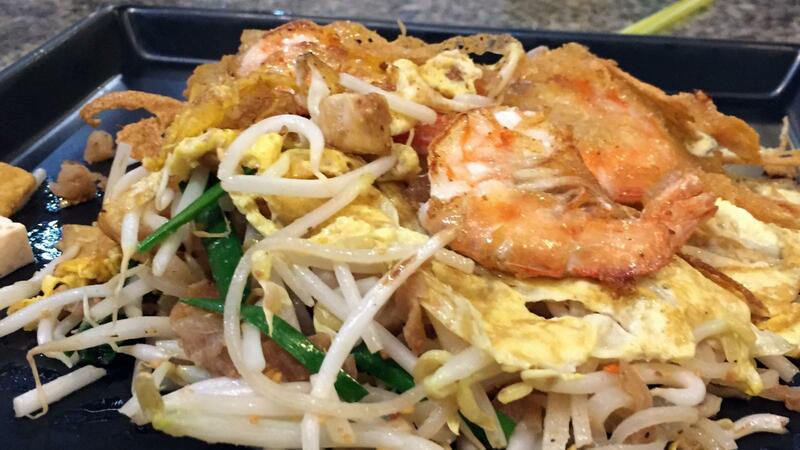 Read this article, as it truly tells about the history of PAD THAI. “Oh god!” said the American expat, rolling her eyes disdainfully, when I told her I was here in Bangkok to write about pad Thai, the noodle dish found in almost every Thai restaurant around the world. I understood her aggrieved response. 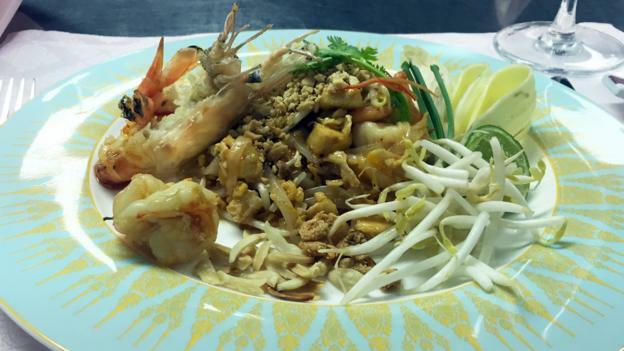 Pad Thai is the first dish most newcomers to Thai cuisine try. And going to Bangkok to find the perfect pad Thai is, to a Thai food aficionado, the culinary equivalent of wearing a Nickelback concert T-shirt. It’s just not cool. But pad Thai was my introduction to Thai food some 20 years ago, and I was immediately hooked. I loved how the flavour of the crushed peanuts interacted with the prawns and rice noodles. I’d never tasted anything like it before. I’ve since moved on to more regional Thai fare, but I wanted to revisit my roots, however uncool that may be. Besides, underneath those wok-fried rice noodles is an intriguing history – one that suggests that pad Thai, the country’s national dish, might not be very Thai at all. This, I confess, was also fuelling my interest. Not only did I want to find the best pad Thai in Bangkok, but I wanted to learn the truth about this ubiquitous dish’s past. I began my search at Sa La Rim Naan, an upscale restaurant run by the Mandarin Oriental and located across from the hotel on the banks of the Chao Phraya River, the wide, murky waterway that buzzes with fishing boats and water taxis. A friend of a friend told me that Prathan Phanim, the chef de partie, made a mean pad Thai. “I make a very traditional version of it,” Phanim said, ushering me into a back room in the kitchen. I watched as he sautéed prawns, fried a couple of eggs with tofu, and then added the rice noodles, which had been soaking in water for hours. He then doused the wok with pad Thai dressing (liquefied chilli, soy beans and shallots), dried shrimp, and a concoction of tamarind and fish sauce, before plating it and topping it all with fresh coriander, lime, peanuts, bean sprouts, and for good measure, a banana leaf. As I stared at the colourful dish, admiring the green coriander, the red chillies and the yellow-green banana leaf , I realised Phanim’s pad Thai looked different from others I’d seen. It looked neater. Better dressed, you could say. At least until I took my fork and mixed everything up, as one is supposed to do before eating it. As for the taste, it was well-balanced. All the requisite flavours were represented, none eclipsing the other. There was sweetness from the sauces, sour from the lime, saltiness from the fish sauce and spiciness from the chillies. I asked Phanim how his approach to pad Thai differed from other chefs. “It’s totally Thai,” he said. But not everyone agrees, including chef Sirichalerm Svasti, who goes by the name Chef McDang. A Thai native who has lived in England and the United States, he is a Bangkok-based celebrity chef and member of the Thai royal family. When I asked him to take me to his favourite pad Thai spot, he suggested we meet at Hot Shoppe, conveniently located about 20 meters from his home in the Thonglor neighbourhood. “So you’re saying pad Thai, the national dish of this country, is Chinese?” I asked. When the order of pad Thai landed at our table, McDang stuck his fork in, twirled some rice noodles around and then took a bite. “Yes,” he said, “this is pretty good.” He was right. It was good, though it was a little sweeter than I’d prefer. Pad Thai, it turns out, was no different. In the late 1930s, Prime Minister Plaek Phibunsongkhram wanted to modernise and unify the country to create a sense of “Thai-ness”. After changing the nation’s name from Siam to Thailand, he sought to create a national dish. There isn’t much documentation on how Phibunsongkhram came upon pad Thai – some historians trace it back to a cooking competition he organised – but suddenly the dish began popping up all over the country. Penny Van Esterik, author of Materializing Thailand, thinks that pad Thai was the first standardised recipe in the country, thanks to the systemic way in which it was handed down and the nationalistic fervour surrounding it. But that said, the dish’s preparation varies today: it may come with a banana leaf on the side; it may be sweeter or sourer; the sauce that’s mixed in may be heavier on chilli. My next stop was to see Jarrett Wrisley, an American-born chef whose Bangkok-based Thai restaurant, Soul Food Mahanakorn, has received many accolades. He suggested we head to Thip Samai, popularly known as Pad Thai Phratu Phi (Ghost Gate pad Thai) because of the restaurant’s proximity to a crematorium. Unfortunately, Thip Samai was closed that day, so we headed to his restaurant instead and began with a plate of his pad Thai. Unlike the version at Sa La Rim Naan, this pad Thai wasn’t as well balanced in flavour – and that was intentional. “I hate sweet pad Thai,” Wrisley said, “so I purposely add extra lime.” But the overall taste was excellent thanks to the top-notch ingredients he uses and the fact that the noodles are cooked until they’re al dente, rather than until they become mushy, which is all too common with pad Thai everywhere. We then wandered across the street to try the dish at Hoy Tod Chaolay, a salt-of-the-earth spot frequented by locals. We were met there by Chawadee Nualkhair, who penned a guidebook on Bangkok street food. “This place made it into my book because it’s very popular for pad Thai,” she told me. But I found the dish here to be too dry. There was no tamarind, it was too sweet and it just didn’t stand up to the other versions I’d sampled. Yes, the dish that introduced the world to Thai food is now being transformed in its native country, thanks to an increasingly homogenising planet. Although nearly all the pad Thai I had in Bangkok was better than versions I’d eaten outside of Thailand, I wasn’t wowed by any of it. I’d fantasised about stumbling upon some tiny out-of-the-way street cart selling the best pad Thai I’d ever eaten. That didn’t happen. I didn’t see as much pad Thai on offer in Bangkok as I thought I would, and most of the people I’d asked to take me to the tastiest version in town hardly budged, choosing restaurants located in their own neighbourhoods. It seems that enthusiasm for pad Thai might be waning, both in Thailand and outside of the country. It’s the regional cuisine of Isaan, located in northeastern Thailand, that’s all the rage among Thai food lovers these days. So has pad Thai run its course? Is this the beginning of the end for a dish pushed at the population 75 years ago? Maybe. On my penultimate day in Bangkok, still intent on finding great pad Thai, I jumped in a cab and directed the driver to Thip Samai, the place Wrisley and I had tried to visit earlier in the week. I arrived right at 5pm, hoping to avoid the spot’s legendary lines. The air was humid, and sweat was dripping from my pores. Still, I couldn’t wait to eat this legendary pad Thai. Soon enough, a plate of the noodles was before me, wrapped in a womb of fried egg. I pushed my fork through and took a bite. The flavours were perfectly balanced. Sourness, sweetness and saltiness all played off one another, with additional hints of charcoal. I added chilli flakes to give it some kick. But after eating about seven versions of pad Thai over three days, I’d grown tired of the dish. Maybe it was the atmosphere – the slightly charred scent from the huge wok; the cacophony of screeches and beeps from the bustling traffic; the various herbs wafting around the sidewalk – but I finished the dish with mixed feelings. This was the last time I would have to eat pad Thai in a while, and yet I didn’t want this moment to end. © 2014 RFC Group Russell Freeman on Google+!|ProPhoto4 WordPress Theme by NetRivet, Inc.